Today is the day to get your gluten freedom on! I am so pleased to have a giveaway from the great Julie Hasson of Julie’s Original Gluten Free Baking Mixes! You already know of Julie from her hit cookbooks such as Vegan Diner and Vegan Pizza, and she also has a new casserole book coming out this fall. You may have been lucky enough to eat at her Native Bowl food cart in Portland, OR, before she and her husband sold it this past spring to focus on their new baking mix business. These mixes are a perfect pantry staple for those who are gluten free and those who need to bake up a quick cake for the gluten free friend’s birthday. There are a lot of questionable recipes floating around the internet that can be hit or miss, but with a box of Julie’s Original you’ll know you’re getting consistent quality. Her website has a whole recipe section, so don’t think you’re just limited to plain white cake or chocolate brownies with these. You can make a lemon raspberry bundt cake or chocolate cherry almond brownies and many more. Follow the Julie’s Original facebook page to see where she’s sampling and where you can buy a box. 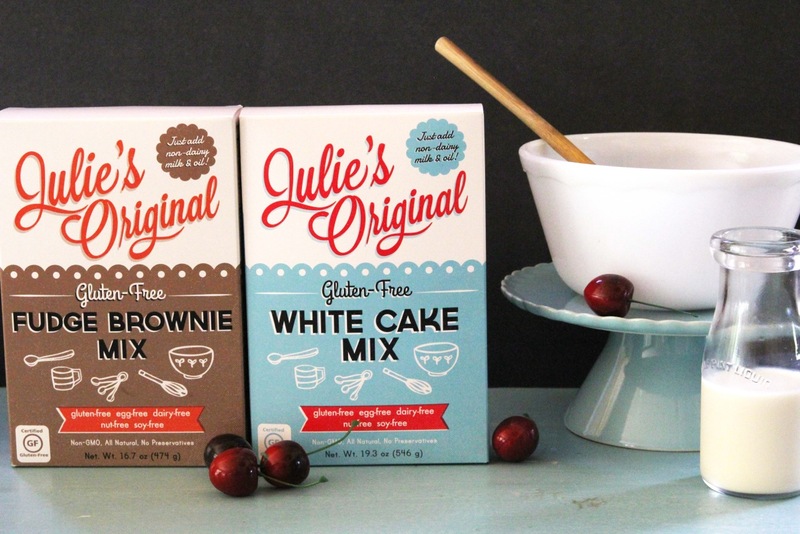 Julie’s Original is offering a box of her gluten free baking mix (white or fudge brownie) to 2 different readers today. To enter, you just need to leave a comment below about which of her recipes you’re looking forward to trying the most. We’ll select two winners at 8 am PDT on September 20th. This giveaway is open to US residents only. You’ve got 24 hours to enter! One entry per person please. Awesome giveaway! I love Julie’s books. The Italian cornmeal cake sounds so good. Anything brownie rocks my world. I’d love to try the gluten-free strawberry shortcake! SO hard to choose! I would go with cornmeal or the white cake. Rhubarb cake and the brownies! Gluten free and vegan can be tricky, so I’d love to try her mixes! The Mocha Java Cake is totally calling my name. And it’s gluten-free too? Score! I’ve tried her chocolate mint brownies, and they were absolutely amazing. The chocolate almond cherry brownies sound delicious! I am a big fan! I’d straight up make the brownie mix! I can’t remember the last time I got to make brownies from a boxed mix. Thanks for the giveaway! Pumpkin Spirce Cake, ’tis the season!! My daughter loves Pineapple Upside Down Cake so I think that would be the recipe I’d try first. The Blackberry Cobbler and Rhubarb Cake recipes would soon follow! Oh, I have a big weakness for strawberry shortcake, and so I’m going to have to choose that! 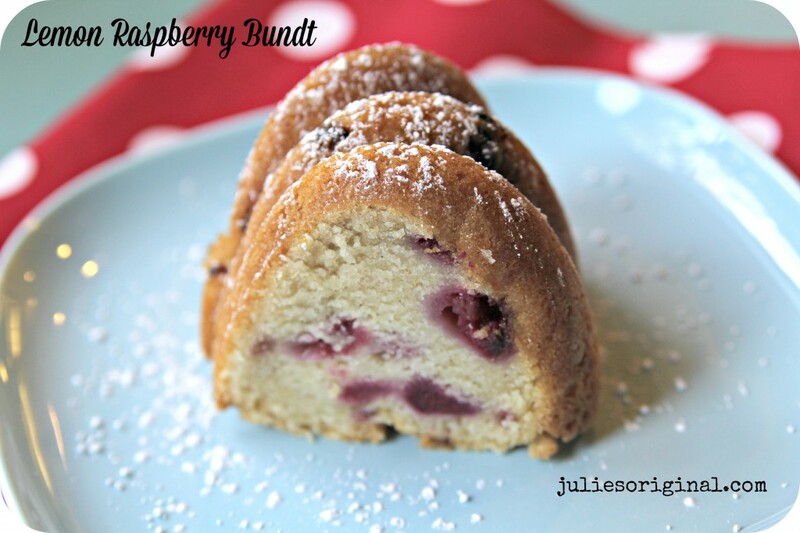 omg you had me at Lemon Raspberry Bundt cake! The vanilla raspberry cupcakes look divine. I am all about that rhubarb cake. I knew I was storing a few pounds of frozen rhubarb for something. Vegan brownie recipes are always hit or miss for me (often miss), so I’d like to see how the brownie mix does! Cake, you say? Brownies, you say?? I’ll have one of each. Please and thank you. I can’t wait to get my hands on that casserole cookbook when it comes out! The recipe for Blackberry Cobbler looks delicious!! I would love to try the vanilla raspberry cupcakes. They look so cute! I would love to try out the Mocha Java Cake recipe. Thanks for the Giveaway! The Blackberry Cobbler looks so good! I want to make the homemade twinkies! Since I love all things zucchini, I’d like to try the Chai Carrot Zucchini Cake recipe.